Haq's Musings: Will Gwadar Grow to Become a Major Metropolis Like Shenzhen? Will Gwadar Grow to Become a Major Metropolis Like Shenzhen? Gwadar is booming. It's being called the next Shenzhen by some and the next Hong Kong by others as an emerging new port city in the region to rival Dubai. Land prices in Gwadar are skyrocketing, according to media reports. Gwadar Airport air traffic growth of 73% was the fastest of all airports in Pakistan where overall air traffic grew by 23% last year, according to Anna Aero publication. A new international airport is now being built in Gwadar to handle soaring passenger and cargo traffic. Chinese private investment company China Pak Investment Corporation has recently announced it is acquiring 3.6 million square foot International Port City project in Gwadar. It plans to develop a $150 million gated community to handle the influx of 500,000 Chinese professionals expected in Gwadar by 2022. "The final master plan for China Pak Hills is currently being refined in Hong Kong, and will feature a range of state-of-the-art amenities including an open-air shopping boulevard; indoor shopping mall; restaurants and eateries; an international school and nursery; six community parks; indoor and outdoor sports facilities including tennis courts and a resident's gymnasium; a water desalination plant and recycling centre. China Pak Hills will also be home to the Gwadar Financial District, catering to the growing financial sector and adding much needed A Grade office space to Gwadar's growing market." Gwadar port's planned capacity when it is completed will be 300 to 400 million tons of cargo annually. It is comparable to the capacity of all of India's ports combined annual capacity of 500 million tons of cargo today. It is far larger than the 10-12 million tons cargo handling capacity planned for Chabahar. To put Gwadar's scale in perspective, let's compare it with the largest US port of Long Beach which handles 80 million tons of cargo, about a quarter of what Gwadar will handle upon completion of the project. Gawadar port will be capable of handling the world's largest container ships and massive oil tankers. Gawadar port is being built in Pakistan by the Chinese as part of the ambitious $46 billion China-Pakistan Economic Corridor (CPEC) that will eventually serve as Hong Kong West for growing Chinese trade with the Middle East and Europe. CPEC will also enable Pakistan to bypass Afghanistan to trade with Central Asia through China across China's borders with Tajikistan, Kyrgyzstan and Kazakhstan. Pakistan suspects that India's real objective in Afghanistan and Iran is to locate its intelligence agents under the cover of Chabahar port construction workers to sabotage China-Pakistan Economic Corridor (CPEC) and support Baloch insurgency to destabilize Pakistan. These suspicions were strengthened when Indian spy Kulbhushan Yadav, operating under the fake name Husain Mubarak Patel, was arrested in Balochistan in March, 2016. Yadav confessed he was operating as an undercover RAW agent from his base in Chabahar, Iran. Indian Prime Minister Narendra Modi has made no secret of his strong opposition to CPEC and his support for Baloch insurgents. Unlike US-Pakistan ties that have been essentially of a transactional nature, Pakistan-China relationship appears to truly strategic. A recent book "The China Pakistan Axis: Asia's New Geopolitics" by American policy analyst Andrew Small quotes a top Chinese official as saying to his American counterparts that "Pakistan is China's Israel". Earlier, in 2011, some news reports quoted Chinese officials as warning that "any attack on Pakistan would be construed as an attack on China". Growing Chinese investment commitments in Pakistan now exceed $100 billion, a further indication of the importance China attaches to Pakistan as one of its closest allies. China-Pakistan ties appear to be truly strategic. The strength of Chinese commitment to Pakistan is increasing with growing investments in China-Pakistan Economic Corridor related projects. It is now highly visible in terms of the influx of the Chinese money and citizens into Pakistan. China's actions on the ground reinforce the credibility of Chinese officials' reported quotes describing Pakistan as "China's Israel" and warnings to the United States that "any attack on Pakistan would be construed as an attack on China". Pakistan-China Defense Ties "Irk West"
How Strategic Are China-Pakistan Ties? Don't know about that. But the aerial view is certainly very impressive and beautiful. Many economic analysts believe that Gwadar is another Dubai emerging on the world’s map. The controversial issue here is that an economically powerful Gwadar threatens the strategic influence of Dubai in the region. This challenging point, recently, has caused a silent economic war in the Gulf of Oman between two groups of countries. Pakistan, China and Qatar on one side. India and the UAE on the other. Dubai is located on the southeast coast of the Persian Gulf. It is the largest and most populous city in the United Arab Emirates (UAE). Dubai has invested in infrastructure to overcome its poor natural resources and become a global business, trade and tourism hub. Thus, Dubai has emerged as a multi-cultural city and enjoys to receive millions of leisure and business visitors each year from around the world. The major revenue of Dubai comes from tourism, aviation, real estate, and financial services. Large construction projects, iconic skyscrapers and sports events are other means of income for Dubai. The world’s tallest building called the Burj Khalifa is located in this emirate. It is clear that the area where Dubai is located can offer a distinct geographical advantage to businesses. There are two major commercial ports in Dubai, Port Rashid and Port Jebel Ali. The latter one is the biggest man-made harbor in the world and the biggest Middle East port. It is home to over 5,000 companies from 120 countries. However, Gwadar port is a serious rival to Dubai. Gwadar port is considered a strategic location, giving China and Central Asia access to the Gulf region and the Middle East. Gwadar port will become the main sea gate for Central Asia. It will also become easier to send products from Xinjiang and central Asian countries to other regions. “The corridor will help reduce transport time for goods from Gwadar port to western China and central Asian regions by about 60 or 70 per cent,” Vice Premier of China Ms Liu Yandong said. On 10 April 2016, talking to The Washington Post, Zhang Baozhong, chairman of China Overseas Port Holding Company said that his company could spend a total of $4.5 billion on roads, power, hotels and other infrastructure for the industrial zone of Gwadar. He also added that the company also plans to build an international airport and power plant for Gwadar. ‘Dubai Investment Forum’, a platform aiming to persuade local and international investors will be held in October under the patronage of Crown Prince of Dubai Sheikh Hamdan bin Mohammed bin Rashid Al Maktoum. Undoubtedly, this Forum is so crucial for the future of Dubai to continue its development as now it has a strong rival named Gwadar. India is another key player in this regional battle. The Chabahar-Gwadar adversary is due to the fact that the ports are at a distance of about 72 km from each other. Both India and Pakistan have been attempting to undermine each other in the region and the development of the two ports is bound to add to the animosity. Karachi is a well established port for Gwadar to work the costs have to be lower than those thru Karachi. There are established business relationships within Gwadar businesses aren't going to shift relationships to Gwadar just because. Theo: "Karachi is a well established port for Gwadar to work the costs have to be lower than those thru Karachi. There are established business relationships within Gwadar businesses aren't going to shift relationships to Gwadar just because." Karachi Port and Port Qasim will grow but still not be able to handle the biggest container ships and the trade volume Gwadar deep sea port is planned for. Gwadar port's planned capacity when it is completed will be 300 to 400 million tons of cargo annually. It is comparable to the capacity of all of India's ports combined annual capacity of 500 million tons of cargo today. An unprecedented Chinese financial and construction effort is rapidly developing Pakistan’s strategically located Arabian Sea port of Gwadar into one of the world’s largest transit and transshipment cargo facilities. The deep water port lies at the convergence of three of the most commercially important regions of the world, the oil-rich Middle East, Central Asia, and South Asia. Beijing is developing Gwadar as part of the China-Pakistan Economic Corridor, known as CPEC. The two countries launched the 15-year joint mega project in 2015 when President Xi Jinping visited Islamabad. Under the cooperation deal construction or improvement of highways, railways, pipelines, power plants, communications and industrial zones is underway in Pakistan with an initially estimated Chinese investment of $46 billion. The aim is to link Gwadar to landlocked western China, including its Muslim-majority Xinjiang region, giving it access to a shorter and secure route through Pakistan to global trade. The port will also provide the shortest route to landlocked Central Asian countries, including Afghanistan, through transit trade and offering transshipment facilities. Chinese fuel imports and trading cargo will be loaded on trucks and ferried to and from Xinjiang through the Karakoram Highway, snaking past snow-caped peaks in northern Pakistan. Gwadar will be able to handle about one million tons of cargo annually by the end of the year. Officials anticipate that with expansion plans under way, the port will become South Asia’s biggest shipping center within five years, with a yearly capacity of handling 13-million tons of cargo. And by 2030, they say, it will be capable of handling up to 400-million tons of cargo annually. China has in recent months begun calling CPEC the flagship project of its global Belt and Road Initiative, or BRI. The “qualitative change” from an experimental project to flagship project underscores the importance Beijing attaches to CPEC, said Zhao Lijian, the deputy chief of mission at the Chinese embassy in Islamabad. Out of 39 “early harvest” projects under CPEC, 19 have since been completed or are under construction with a Chinese investment of about $18.5 billion, Lijian told VOA. The progress makes it the fastest developing of all of at least six BRI’s corridors China plans to establish, added the Chinese diplomat. The construction industry is playing an important role in economic growth of Pakistan. Recent (provisional) estimates published in the Economic Survey of Pakistan show that the industry grew 9.1% in FY17 and contributed 2.7% to the country’s gross domestic product (GDP). BMI Research has also provided a healthy growth outlook for the sector, putting it at 11.8% annually from 2016-20 and 9.1% over 2016-25. The signing of the China-Pakistan Economic Corridor (CPEC) agreement and improvement in the country’s security situation have been the key to giving boost to not only the construction industry, but Pakistan’s image abroad. With China having the first-mover advantage in injecting foreign investment into the country, other countries have followed suit. The sector has also been an important recipient of foreign direct investment (FDI). This can be judged from the latest figures provided by the State Bank of Pakistan, which show that the construction industry received a net inflow of $35.7 million in August 2017. How attractive the industry is perceived to be for foreign investors can be gauged from the fact that in the current fiscal year from July-August FY18 the industry has received $55.7 million relative to $1.6 million in the same period of last year. Locally, investment has also been boosted by government policies such as reduction in duties and taxes on building materials like steel, construction machinery and equipment and computerisation of land ownership records. I have been following your posts for the last decade about how the big T(har coal fields), the big R(eqo Diq copper mines) and the big G(wadar port) will transform Pakistan. We have seen how the big T and big R have panned out. lets hope big G will shape up to your dreams. It is comparable to the capacity of all of India's ports combined annual capacity of 500 million tons of cargo today. As with most of your information about India, this is dated. India's port capacity is around 1.5 billion MT and in FY 2014-15 it was already handling over 1 billion MT of cargo. It is expected that by 2025, the ports will be required to handle a cargo of 2500 MTPA while the current port capacity in India is 1500 MTPA. Majumdar: "I have been following your posts for the last decade about how the big T(har coal fields), the big R(eqo Diq copper mines) and the big G(wadar port) will transform Pakistan. We have seen how the big T and big R have panned out. lets hope big G will shape up to your dreams." The massive coal and mineral deposits in Pakistan are there and continue to be worth trillions of dollars. Thar coal development is in full gear now and Pakistan is beginning to take advantage of coal deposits. I expect other mineral extraction elsewhere including Reko Diq will follow sooner or later. As to Gwadar, it again is reality and it's growing everyday as today's VOA report puts it: " An unprecedented Chinese financial and construction effort is rapidly developing Pakistan’s strategically located Arabian Sea port of Gwadar into one of the world’s largest transit and transshipment cargo facilities......And by 2030, they say, it will be capable of handling up to 400-million tons of cargo annually." 400 million tons capacity is massive for a single port in Pakistan by any measure....even if you compare it to total billion tons capacity of all of India's ports today. Thar coal development is in full gear now and Pakistan is beginning to take advantage of coal deposits. If energy experts are to be believed, Thar coal is of very poor quality and will never be a major contributor to Pakistans energy basket. I expect other mineral extraction elsewhere including Reko Diq will follow sooner or later. Maybe. But as things stand today, not an ounce has been extracted and on top of that, because of that one eyed CJP, already billions of dollars of claims are outstanding against Pak. Mundra, owned and operated by ModiGee's friend Gautambhai already has a capacity of 300 + million MTPA and there is a proposal to increase it to 600 million MTPA. The actual cargo handled however is only a shade over 100 million MT. 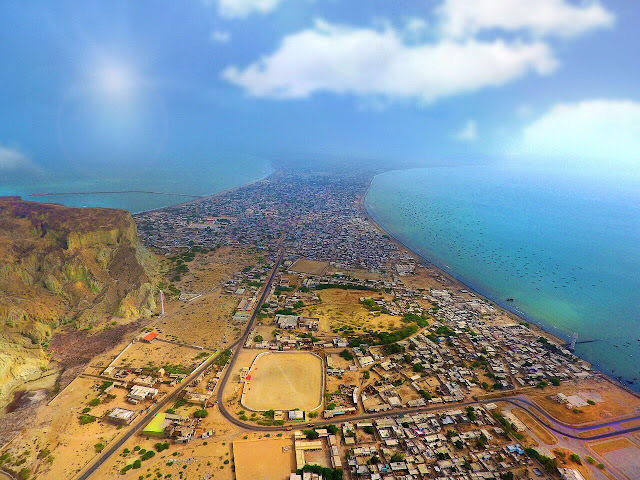 Gwadar is a good development alright but dont expect it to be a gamechanger. Majumdar: "If energy experts are to be believed, Thar coal is of very poor quality and will never be a major contributor to Pakistans energy basket." It's by choice. Historic low LNG prices make it a more attractive option for Pakistan. Majumdar:" Maybe. But as things stand today, not an ounce has been extracted"
Have you heard about Saindak? The Saindak Metals Limited (SML) has produced 76,125.994 metric tons (mt) copper, 6.093 mt gold and 9.693 mt silver from the Saindak area, district Chaghi of the Balochistan province, during last five years. Majumdar: " Gwadar is a good development alright but dont expect it to be a gamechanger. " Gwadar port is huge but it won't be a gamechanger by itself. But CPEC is definitely a gamechanger. Not a chance. Shenzhen was built by the Chinese and they have developed it as a city. Their interest in Gwadar is only the port and the connection to the port. If Pakistan wants Gwadar to be like Shenzhen then Pakistani's need to get off their own backside and build it up themselves. We won't do that - we don't do things like that. We have an attitude of thinking about what baba ji left for me, rather than what i can build. Ghazi: "If Pakistan wants Gwadar to be like Shenzhen then Pakistani's need to get off their own backside and build it up themselves. We won't do that - we don't do things like that. We have an attitude of thinking about what baba ji left for me, rather than what i can build." Pakistani engineers and workers have built much of the Gulf Arab ports and cities like Dubai. They don't shy away from hard work. A lot of the infrastructure in Pakistan is now being built by Pakistani contractors like Frontier Works Organization (FWO). What Pakistanis lack is sufficient capital which the Chinese are bringing as lead investors. A recent Pew Survey of 21 countries reported that 81% of Pakistanis believe in hard work to achieve material success. Americans are the second most optimistic with 77% sharing this belief followed by Tunisians (73%), Brazilians (69%), Indians (67%) and Mexicans (65%). Good for Pakistan! How is or will the game change? Is GDP growth of 8+, export growth yoy 20%+ macroeconomic parameters changing ? Unlike the US Marshall Plan which floated bonds to help fund European economies, a report from Fitch Ratings suggests that China's plan to build ports, roads, railways, and other forms of infrastructure in under-developed Eurasia and Africa is out of political motivation rather than real demand for infrastructure. The Fitch report also doubts Chinese banks' ability to control risks, as they do not have a good record of allocating resources efficiently at home, which may lead to new asset-quality problems for Chinese banks that most of funding is likely to come from. Having said that if Pakistan does improve its economic fundamentals such as savings rate, exports and GDP debt ratio, its economy may hit a higher growth rate and make CPEC a success. Otherwise the CPEC benefit will be muted. Large-scale manufacturing (LSM) observed a growth of 11.3 percent during first two months (July-August) of fiscal year 2017-18 on year-on-year basis. According to the data by the Pakistan Bureau of Statistics, the sector recorded an increase of 13 percent in July. The annual growth target for the LSM is 6.3pc, while it had achieved 5.6pc in previous financial year 2016-17. In August, the LSM observed a growth of 8.5 percent on annual basis. In total manufacturing, LSM’s share stands at 80pc, while small-scale manufacturing constitutes 13.7pc. Similarly, the mega manufacturing constitutes 10.7pc of total GDP (Gross Domestic Product) against 1.8pc of small level manufacturing. As per Ministry of Industries’s data regarding 36 products, these items made 5.44pc of total LSM growth in August. The share of 65 items, whose manufacturing data is provided by provincial bureaus of statistics, recorded at 1.3pc. The Oil Companies Advisory Committee’s (OCAC) data regarding 11 items stated that theses items contributed 1.8 percent in growth of LSM during the second month. Some 30,000 Chinese are working on different development projects, including the China-Pakistan Economic Corridor (CPEC), a major cooperation project between the two countries. Beijing’s infrastructure splurge has helped revive Pakistan’s sputtering economy, and deepening ties between the two nations have turned Pakistan into a key cog in China’s grand plan to build a modern-day “Silk Road” of land and sea trade routes linking Asia with Europe and Africa. While the first phase of CPEC, as the Pakistan leg of this new Silk Road is called, concentrated on infrastructure projects, the second part will focus on setting up special economic zones and integrating Chinese firms into the local economy to help Pakistan develop its industries ranging from mining to agriculture. China has also surged to become by far the biggest source of foreign direct investment (FDI) for Pakistan , topping $1 billion in 2016/17, and is betting on its neighbour at a time when many Western companies are still put off by security concerns and corruption. The federal government on Monday warned the general public not to pay any heed to the rumours about a heavy investment, allegedly made by a Chinese in the real estate business in Gwadar, and asked the investors not to invest in any phoney company which might be involved in a massive fraud. In an official statement, the spokesman of Ministry of Planning, Development and Reform cautioned the public at large not to pay heed towards an alleged investment of US $500 million in Gwadar’s real estate business under the name of ‘China Pak Hills’. Apropos news item – “Chinese company invests $500 million in Gwadar residential project” – published in a section of the press, has claimed that China Pak Hills has invested US $500 million in Gwadar’s real estate business. It is to put on record that Gwadar Development Authority (GDA) has not issued any No Objection Certificate (NOC) to a housing project named as ‘China Pak Hills’, said an official handout by China Pakistan Economic Corridor (CPEC) Secretariat at Ministry of Planning, Development and Reform. “The report is baseless and highly exaggerated. Even GDA has no information about $500m Chinese investment in the housing sector,” said the spokesperson. He further stated that the news item presented a highly exaggerated scenario about Chinese professionals shifting to Gwadar by 2023. “The newspaper should have contacted the ministry of planning before publishing such news item having such content,” the statement added. However, Phunchok Stobdan, a former Indian ambassador to Kyrgyzstan and a distinguished academic, questions the economic viability of the port. “In terms of slogans, yes, you can call it a new era of connectivity. But how much substance is there, we don’t know. It is just a beginning. It is more about political opportunism than economic benefits, as I see it,” said Stobdan, who is also a senior fellow at New Delhi-based think tank, Institute of Defence Studies and Analysis (IDSA). “What do you want to export and what you want to import?” he continued. “There are no high-value items to trade between India and Afghanistan. The Chabahar port, located in the Sistan-Balochistan province of Iran’s southern coast, is seen by some as a counter to Pakistan’s Gwadar Port — which is being developed with Chinese investment and is located around 85 km from Chabahar — and, by extension to the China-Pakistan Economic Corridor (CPEC). Pakistan is set to see a new real estate venture – this time in the federal capital – as demand for housing keeps motivating projects across different parts of the country. The $2-billion project, named Eighteen Islamabad based on its location, was formally launched in Islamabad on Friday and is a partnership between Egypt-based Ora Developers and Saif Group, the Pakistani conglomerate with business interests largely in textile, energy and real estate sectors. Additionally, Kohistan Builders and Developers is also partaking in the project. Spread across 2.77 million square yards that will also feature a 18-hole golf course, the project will look to sell over 2,000 residential units – 1,068 villas of different sizes and over 900 apartments – along with commercial properties, meant to serve the upper-middle income groups. The project also brings Egyptian billionaire Naguib Sawiris back to Pakistan after Orascom Telecom Media and Technology Holding, in which he has a majority stake and is also the chairman, had acquired Mobilink before the company sold its stake to VimpelCom. Sawiris, however, is now on a different mission to Pakistan. “I was here around 20 years ago when we started Mobilink,” said Sawiris, the chairman of Ora Developers, as he addressed a gathering of journalists at Serena Hotel. “We wanted to continue our business in Pakistan and as we ventured out of telecom we thought of real estate development because I was horrified at the prices people were paying for villas and apartments in Islamabad,” he continued, referring to the phenomenally high prices of real estate in Pakistan that have continued to shoot in the last few years. According to a World Bank estimate, there is a shortage of 10 million housing units in Pakistan, a deficit that continues to grow in urban areas. With population growth at 2%, the shortage will keep piling. Sawiris said his aim would be to expand to other cities including Karachi and Lahore, but the challenge would be to find land in the provincial capitals. The $2-billion project features a 30% component of equity, to be injected by the investors, along with a 30% stake to be financed with major banks in Pakistan. Talks of these modalities are ongoing, said Eighteen Islamabad Chief Executive Officer Tarek Hamdy. He also said no-objection certificates have been obtained from the Capital Development Authority in Islamabad and transfer deeds will be given to buyers since Eighteen Islamabad owns the land already. Beijing plans to build its second offshore naval base near a strategically important Pakistani port following the opening of its first facility in Djibouti on the Horn of Africa last year. Beijing-based military analyst Zhou Chenming said the base near the Gwadar port on the Arabian Sea would be used to dock and maintain naval vessels, as well as provide other logistical support services. “China needs to set up another base in Gwadar for its warships because Gwadar is now a civilian port,” Zhou said. Another source close to the People’s Liberation Army confirmed that the navy would set up a base near Gwadar similar to the one already up and running in Djibouti. “Gwadar port can’t provide specific services for warships ... Public order there is in a mess. It is not a good place to carry out military logistical support,” the source said. The confirmation follows a report this week on Washington-based website The Daily Caller in which retired US Army Reserve colonel Lawrence Sellin said meetings between high-ranking Chinese and Pakistani military officers indicated Beijing would build a military base on the Jiwani peninsula near Gwadar and close to the Iranian border. Sellin said the plan would include a naval base and an expansion of the existing airport on the peninsula, both requiring the establishment of a security zone and the forced relocation of long-time residents. Gwadar port is a key part of the China-Pakistan Economic Corridor, a centrepiece of Chinese President Xi Jinping’s broader “Belt and Road Initiative” to link China through trade and infrastructure to Africa and Europe and beyond. The corridor is a multibillion-dollar set of infrastructure projects linking China and Pakistan, and includes a series of road and transport links. Sellin also said the Jiwani base could be “signs of Chinese militarisation of Pakistan, in particular, and in the Indian Ocean”. Chinese military observers said Gwadar had great geostrategic and military importance to China but China was not about to “militarise” Pakistan. Zhou said China wanted better access to the Indian Ocean, which was now largely limited to the Strait of Malacca in Southeast Asia. The Gwadar port could be a transit hub for sea and land routes once the corridor’s railway was up and running, helping improve and cut the cost of logistics for China. “The Chinese naval flotilla patrolling in the Gulf of Aden and other warships escorting Chinese oil tankers in the Indian Ocean need a naval base for maintenance as well as logistical supplies because they can’t buy much of what they need in Pakistan,” Zhou said. Rajeev Ranjan Chaturvedy, a research associate at the Institute of South Asian Studies at the National University of Singapore, said India was well aware of China’s plans in Pakistan. “China finds it very useful to use Pakistan against India and ignore India’s concerns, particularly on terrorism issues. That has created a lot of stress in the relationship between Beijing and Delhi,” he said. This mega oil city will be used for transportation of imported oil through the Gwadar Port to China. The oil will be imported from Gulf and will be stored at this proposed mega Gwadar oil city. The distance to China will be reduced, and it will take just seven days to cover the distance from Gwadar to Chinese border as import through western China took almost 40 days by covering double distance. “We have forwarded PC-1 to the Ministry of Petroleum for acquiring 80,000 acres for this mega oil city at Gwadar with estimated cost of Rs10 billion. There will be additional cost for construction of its storage and other aligned facilities with the help of investments,” Director General, Gwadar Development Authority (GDA), Dr Sajjad H Baloch, told Islamabad based journalists who visited the Gwadar Port last week. This visit was arranged by the Planning Commission in order to show case different ongoing projects under CPEC. A refinery, petrochemical industries and storage will be established in the oil city, he added. The Gwadar oil city, he said, would be used for storing oil for its onward transportation to China. Usually, it takes 40 days for vessels to transport oil to China but via Pakistan it will reach China within 7 days, he added. He said that the total area of Gwadar Model City is 290,000 acres which includes 160,000 acres of residential area while the remaining is for industrial purposes. A Chinese company is working on the Model City Plan and it will be ready by August 14, 2018. To another query regarding different measures for overcoming water shortages at Gwadar, he said that the current water requirement stood at six million gallons per day and there is no direct water supply taking place to the area. Two MGD water is being supplied from two water small dams through tankers and nearest distance is almost 70 kilometres. “We have a deficit of four million gallons per day in water supply to the area,” he said and added that by 2020, the water requirement of Gwadar would be 12 million gallons per day, for which additional arrangements were made to get 10 million gallons of water. New Gwadar International Airport: Earlier, the journalists visited the site of proposed new airport at Gwadar. The China Airport Construction Group Engineering Company representative Jianxin Liao told the visiting journalists that they were conducting soil investigation on the basis of which, the design of new airport at Gwadar will be finalised. He said that the procured land for this new airport stood at 4,300 acres, and this airport will possess capacity to handle one million passengers on annual basis. He said that by April this year the design will be completed after which the cost of the project will be estimated. It will be the biggest airport of Pakistan. 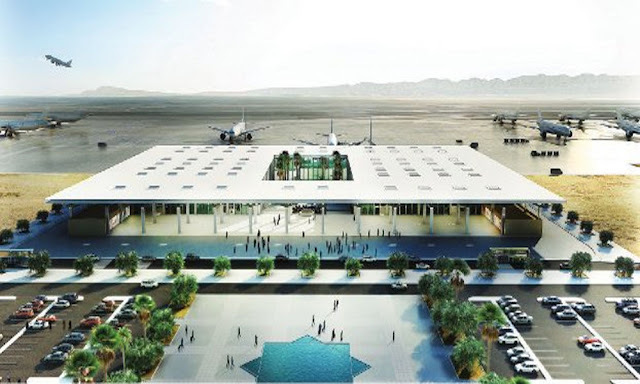 The Civil Aviation Authority (CAA) representative Zohaib Soomro said that the initial cost of the project was estimated at $228 million, but its cost would be finalised after completion of design, and it would be estimated again. The sources said that it would be premature to give any assessment related to cost, but it would be more than $2 billion to $2.7 billion at least if we want to construct state of the art airport in accordance with international standards. Pakistan and China have jointly organized the first international exhibition to showcase the significance of the Arabian Sea Gwadar Port and its economic free zone as an emerging international business hub. The warm water deep sea commercial port, which overlooks some of the world’s busiest oil and gas shipping lanes, has been built and recently expanded with Chinese financial assistance. More than 200 companies from both China and Pakistan were present in Monday’s event at Gwadar, while six Chinese provinces also sent their representatives, said Beijing’s ambassador to Islamabad, Yao Jing, while addressing the ceremony. Foreign diplomats and business leaders were also invited to the opening session of the two-day event. Chinese operators of the port say the Gwadar Free Zone shall bring extensive economic benefits, like a tax holiday for 23 years and land lease up to 99 years to the upcoming businesses along with other incentives and pro-business policy frame work for general trade, services, manufacturing, logistics, trans-shipment and bunkering business. Gwardar port is to be a trans-shipment hub connected to landlocked western Chinese regions, giving Beijing a secure and shorter international trade route through Pakistan. Gwadar is celebrated as the gateway to the China-Pakistan Economic Corridor, or CPEC, a flagship of President Xi Jinping’s global Belt and Road Initiative to build a new “Silk Road” of land and maritime trade routes across more than 60 countries in Asia, Europe and Africa. Under CPEC, networks of road, communications, rail, economic zones and power plants are being built and upgraded in Pakistan with an estimated Chinese investment of $62 billion. Around $27 billion in projects are underway or completed, including “early harvest” energy projects, adding much-needed electricity to Pakistan’s national grid. “I would like to say that the Chinese government will continue to invest and send our input to further support the development of this project. Also, we will encourage Chinese companies and Chinese businessmen to join the development of Gwadar,” vowed Chinese envoy Jing. During the ceremony, Pakistani Prime Minister Shahid Khaqan Abbasi said CPEC is the “most visible part” of China’s of BRI, saying the mega project will cater not only to the needs of his country, but to the needs of the region. Officials expect Gwadar’s cargo handling capacity to increase to 1.2 million tonnes by the end of this year and it will be able to process about 13 million tons by 2022, making it the largest port in South Asia. Chinese partners say they would need around 38,000 skilled workers by 2023 for the Free Zone, according to Dostain Jamaldini, Chairman of the Gwadar Port Authority. He says of the 2,500 current workers, around 500 are Chinese nationals and the rest are locals. An international airport with a 12,000 meter runway is being constructed in the once sleepy town with a Chinese financial grant of around $300 million. The Arabian Sea port is located in Pakistan’s largest province of Baluchistan where militant groups, including Islamic State, and a low-level insurgency remain key security challenges to CPEC. Additionally, the corridor runs through Pakistan-controlled portion of the divided Kashmir region, drawing objections from rival India. The United States suspects China may also turn Gwadar into a military base. But Chinese officials reject those concerns, maintaining “CPEC is merely an economic cooperation project,” and Islamabad dismisses New Delhi’s opposition as politically motivated. Pakistani officials say the U.S.-led NATO military coalition in Afghanistan has offered to import vital supplies through the southwestern port of Gwadar, calling it a much shorter and economically viable route into landlocked Afghanistan. The federal minister for maritime affairs, Hasil Bizenjo, says NATO representatives proposed the idea at a recent meeting he convened with local and international business leaders. “They (NATO) are very interested and we are working on it,” Bizenjo told VOA in an interview. The coalition of about 16,000 troops, known as Resolute Support, mostly consists of Americans advising and assisting Afghan forces in their battle against the Taliban and other militant groups. The military mission is dependent on ground lines of communication and air lines of communication, known as GLOC and ALOC, through Pakistan for receiving supplies. Currently, NATO supplies are shipped through the southern Pakistani port of Karachi, where they then are placed on trucks and transported on a week-long journey to neighboring Afghanistan via the northwestern Torkham border crossing. “NATO people told us it would be extremely convenient for them in terms of quick transportation of supplies from Gwadar directly to Kandahar. They are very interested and we are working on it,” Bizenjo told VOA in an interview. The Chinese-built, Arabian Sea port of Gwadar is in the southwestern Baluchistan province adjoining Afghanistan's Kandahar province, which hosts one of the five U.S. military bases in the war-shattered country. Gwadar port is connected to the Chaman border crossing with Kandahar through a newly constructed highway, enabling truck convoys to reach Afghanistan in fewer than 24 hours. Pakistani minister Bizenjo said companies dealing in Afghan transit trade also want their cargo to be shipped completely through Gwadar. “Another meeting with Pakistani business and NATO representatives and Afghan transit trade dealers has also been scheduled to further the discussions, Bizenjo said, without saying when. Pakistan earned the status of non-NATO ally for allowing U.S.-led international forces to use the GLOC and ALOC supply lines to invade Afghanistan in 2001 and oust the Taliban from power for harboring al-Qaida leaders. In return, Islamabad received U.S. security assistance and civilian aid. The proposal to redirect U.S. and NATO military cargo from Karachi to Gwadar comes as Pakistan’s traditionally rollercoaster relations with the United States suffer fresh setbacks. For decades, Pakistanis have dreamed for Gwadar to become the next Dubai. Yet the port city in southwestern Pakistan, despite its advantageous location on the shores of the Arabian Sea, had long remained underdeveloped in the past. “Gwadar will lead the take-off of Pakistan’s economy. It will be the next Dubai or Hong Kong,” local banker Masood Awan said. Pakistan International Airlines (PIA) had to increase the frequency of its flights from Karachi to Gwadar from one to two per day, while announcing that a new flight from Pakistan’s capital Islamabad to Gwadar will be open by the end of the year. Even without a booth, Niazi and his colleagues flew to Gwadar from Pakistan’s largest city of Karachi. He stayed after the trade fair closed on Jan. 30, busy making new business contacts. “We are determined to expand our business to Gwadar. The speed of development is just amazing,” Niazi said. China’s Red Cross Society helped build a medical station, while China Foundation for Peace and Development help set up a primary school there. “Better living conditions means better investment environment and more talents. Helping the locals is also helping ourselves,” Hu said. “Investment by experienced and competent Chinese companies is encouraging for the future of Gwadar. The port will one day become a top destination for business and tourism, a regional, even global trade center,” said Dostain Khan Jamaldini, chairman of Gwadar Port Authority. Wade Shepard, a Forbes contributor, believed a “clearly stated plan” is behind CPEC’s progress. China and Pakistan publicized a long-term plan for CPEC in 2017. State-owned Chinese construction company China Civil Engineering Construction Corporation (CCECC) has announced that it has entered into agreement for the construction of Gwadar's first luxury gated Golf Community with a Pakistani company. Empire Properties, the Pakistan registered company, and the CCECC have signed a memorandum of understanding as the prospective contractor for the construction of China Pak Golf Estates, Gwadar's first luxury Golf Community. The $265 million development is a milestone in the development of Gwadar and will deliver the emerging port city’s most premier residential and lifestyle destination, said a joint press release issued here. Commenting on the partnership Mr Wang Lei, Managing Director CCECC (Pakistan) said: "It is a great honour to be working alongside a forward thinking international conglomerate like CPIC. China Pak Golf Estates is a ground breaking development for not only Gwadar but Pakistan and we are honoured to be a part of this monumental project and contributing to the growth story of Emerging Pakistan. CCECC are a leading global contractor with 39 years of experience in over 40 countries delivering high quality projects ranging from civil engineering design and consultancy to real estate development. We aim to deliver a timeless community in China Pak Golf Estates that will set a new standard to master community development in Pakistan." Afzal Shah, CEO or Empire Properties said: "China Pak Golf Estates will truly set a new standard to real estate community development in Pakistan and there isn't a better company we could be working with to deliver this grand vision than CCECC. I would like to extend a warm welcome to Mr Wang Lei and his team as we embark on this virtuous journey together. Our vision extends beyond developing Pakistan's finest communities, we will change the fabric of Pakistan's real estate industry by setting a new benchmark for integrity and transparency in a market that at times can be described as less than open. Our goal is to elevate the market to the same standards as established international markets. This will result in the introduction of institutional investment which in turn will revolutionise the country’s real estate sector and deliver the quality of life Pakistanis deserve". The Pakistani property market has experienced growing interest in recent years, largely due to close international ties between China and Pakistan. In 2013, Chinese President Xi Jinping announced the China-Pakistan Economic Corridor (CPEC), a $62bn project to develop Pakistani infrastructure and energy. With better access to cities across Pakistan, investors are seeing more opportunities to build on the land near these new developments. CPEC projects include the $2.8bn Peshawar-Karachi Motorway, set to open in August 2019, and the East Bay Expressway in Gwadar Port in the south, which is due to be completed later this year. Both will dramatically help to facilitate real estate developments on previously barren land. Rather than building in megacities like Karachi, investors are taking their money to more peripheral locations in order to create urban clusters on formerly agricultural ground, a move that is known as ‘peri-urbanisation’. “The landscape has visibly changed with the proliferation of housing societies and gated housing enclaves moving along highways towards secondary cities,” according to Anjum Altaf of the Lahore University of Management Sciences. As a consequence, investment in residential property increased from five to seven percent between 2015 and 2016. Pakistan’s growing middle class is a major driving force in the rising popularity of these gated housing communities. Luxury development projects, carried out by companies like Bahria Town, DHA City and the Fazaia Housing Scheme, for instance, are some of the most sought after – by those who can afford them. These measures have encouraged foreign investors, and Pakistani expats in particular, to pour money into the housing sector. At present, much of this FDI comes from Egypt. Serving as an example of this is a new $2bn real estate development just outside Islamabad – the first of its kind from Egyptian billionaire Naguib Sawiris. Once finished, the complex will cater to every need of its occupants, providing everything from luxury housing units and schools to hospitals. “That’s what every Pakistani housing scheme coming from FDI looks like. They all tout the same thing: the American dream for Pakistani citizens,” Ahmad explained. The construction of the airport will be completed within three years at the cost of US$256million. Unlike other projects under the China-Pakistan Economic Corridor (CPEC) are operating under concessional loans, the Airport is planned under a Chinese grant. The airport will also be the biggest in Pakistan at an area of 4,300 acres. It will be the biggest airport of Pakistan. In comparison to other airports like Karachi Airport (3,700 acres), Islamabad International Airport (3,600 acres), Lahore Airport (2,800 acres), the Gwadar Airport will be built on 4,300 acres. The project is part of overall infrastructure development of Balochistan. It would be developed as a green-field facility with all modern facilities for safe operation. The project would comprise a modern terminal building with cargo terminal having initial handling capacity of 30,000 tons per year. On this occasion, a memorandum of understanding (MoU) was signed for construction of Pakistan and China Vocational Training Institute and Pak-China Friendship Hospital. Prime Minister Imran thanked the Chinese Ambassador for the grant given by the Chinese government for the airport. He categorically said any development would be of no use unless it benefited the local people. He said in the past, the locals were ignored while executing the development projects in Balochistan. He said gas worth billions of rupees was extracted from Sui but it could not change the living standard of the local people. He said it was pleasing that the capacity of the hospital in Gwadar would be enhanced and a vocational training institute would also help create employment opportunities. Prime Minister Imran announced to launch Insaf Sehat Card (health card) to provide health insurance cover worth Rs720,000 to every family. He said previously power was being transmitted from Iran, but now the government had decided to link the area with national grid. A desalination plant would also be set up in the city and under Clean and Green Pakistan, one million saplings would be planted. Besides, a solid waste management system would also be established to protect the area from pollution. He said following the models of Dubai, Abu Dhabi and Sharjah, the government had decided to recycle water in Gwadar to water the plants. He told the gathering that Gwadar and Quetta would be linked through railways as it was the best travel mode but unfortunately Pakistan had been lagging behind in this sector. He said Chinese support was being sought to upgrade railway lines as China had the most advanced rail system. A high-speed rail link would cut travel time bewteen Karachi and Lahore to within four hours, instead of 18 hours by car, or 21 hours by bus at the moment. Khan said having located at an ideal location and being well connected, Gwadar’s development would be the development of whole of Pakistan. During the development process of the new airport, the existing airport’s capacity would also be enhanced by making it capable of transporting big aircrafts. With the establishment of new international airport, the Gwadar city would become hub of aviation industry and it would also help elevating the CPEC framework.